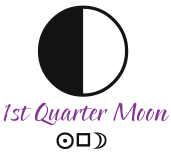 The FIRST QUARTER MOON occurs on Friday, April 12, 2019, at 3:06 PM EDT. The First Quarter Moon occurs on Friday when the Sun in Aries forms a square with the Cancer Moon. There is a crisis theme surrounding any quarter Moon phase, as we feel compelled to take action. Shortly after, we are made aware of how our actions affect those close to us, perhaps through trial and error. Whatever project or initiative we began around the New Moon last week is now off the ground, and it may face its first obstacles. 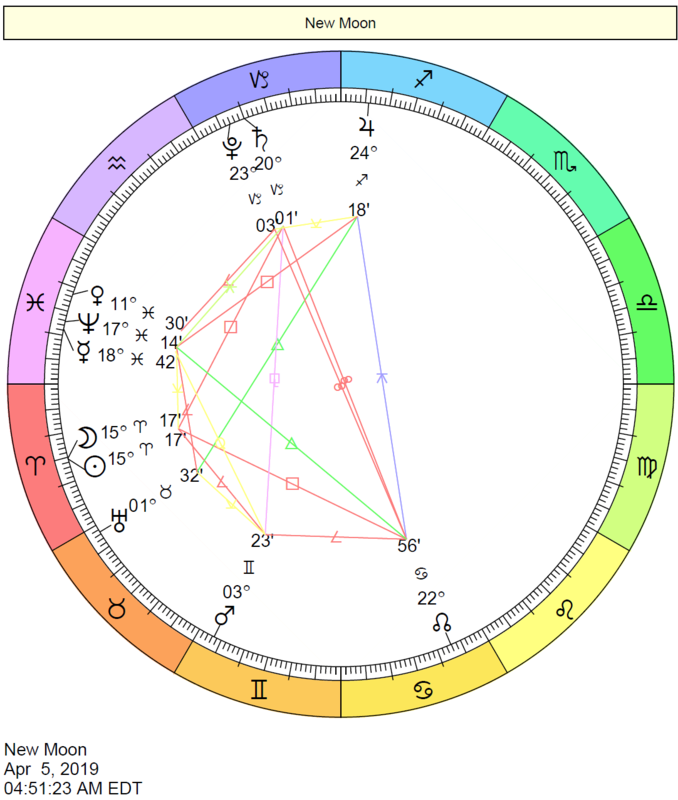 This phase of the Moon occurs at 22 degrees and 35 minutes of Cancer square the Sun at 22 degrees and 35 minutes of Aries, affecting people born with personal planets and points at approximately 21 to 25 degrees of the Cardinal signs (Aries, Cancer, Libra, and Capricorn) most significantly. The NEW MOON occurred on Friday, April 5th, 2019, at 4:50 AM EDT. On Friday morning, the New Moon occurred. The New Moon in Aries marked the beginning of a new cycle. 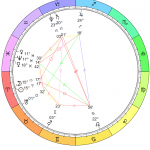 The Pisces New Moon cycle ended and the Aries New Moon cycle began. The New Moon in Aries is a good time to commit to personal goals that express the positive energies of the sign of the Ram. It’s time to take action – try something new and innovative, and go at it with gusto and confidence; be assertive without being abrasive; take charge of our lives; start a brand new project, and discover our own personal courage. 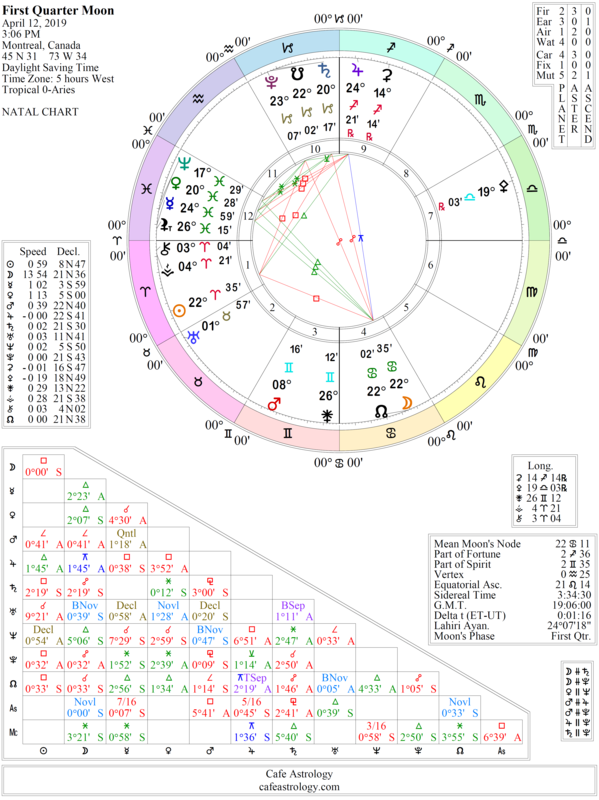 This phase of the Moon occurred at 15 degrees and 17 minutes of Aries, affecting people born with personal planets and points at approximately 11 to 19 degrees of the Cardinal signs (Aries, Cancer, Libra, and Capricorn) most significantly. This week: The Sun is in Aries; Mercury is in Pisces; Venus is in Pisces; Mars is in Gemini. This week: On Tuesday and Wednesday, our senses are engaged and we prefer to see our relationships through a happy, spiritual, or romantic lens. Even so, this occurs when the Sun forms a square to Saturn, and we may be either swinging between an overly practical or realistic outlook to an overly unrealistic perspective, or we are seeing our relationships in an especially romantic light while other areas of life require a hard look. On Thursday and Friday, however, we’re seeing things for their imperfections, and it feels just fine to do so. We value a realistic view, as well as stability and steadiness in our social or love lives. Venus sextile Pluto April 13-14. Subtly powerful and uplifting time for romantic/sexual relationships. New insights into relationships and love. Strong attractions. Venus square Jupiter April 14-15. We experience a strong desire for more pleasure in our lives, which can be excessive. Take care not to overstate your feelings or to set up unrealistic expectations in your partnerships. As well, take what your partner says with a grain of salt. There is no malicious intent involved, but feelings of elation can cloud our judgment, and we can promise more than we can deliver. Venus conjunct Chiron April 22-23. Healing energy is brought to love relationships, and a new cycle begins. A commitment-friendly transit. Love can heal old wounds. We are open to romantic feelings, and more willing to act upon them. This is a good time to make a resolution to repair, heal, and improve relationships. 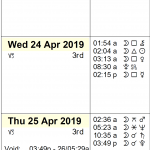 Void-of-course Moon on Monday, April 8th, from 4:29 AM EDT, with the Moon’s last aspect before changing signs (a trine to Pluto), until the Moon enters Gemini at 5:15 PM EDT. 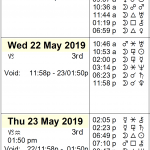 VOC Moon on Wednesday, April 10th, from 1:27 PM EDT, with the Moon’s last aspect before changing signs (an opposition to Jupiter), until the Moon enters Cancer at 11:31 PM EDT. 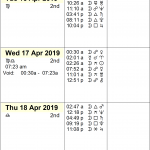 VOC Moon on Friday, April 12th, from 7:33 PM EDT, with the Moon’s last aspect before changing signs (a trine to Mercury), until the Moon enters Leo the next day, Saturday, April 13th, at 3:50 AM EDT. This week, the Moon is waxing this week – a period that is generally considered favorable for new beginnings with exceptions. (See Best Time to Start a Business for more details). 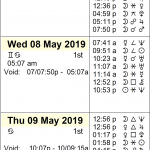 According to principles of timing with the Moon, a window of opportunity occurs this week from Saturday, April 6th, at approximately 9:10 AM EDT, until Monday, April 8th, at approximately 4:25 AM EDT, while the Moon is in Taurus. Another window occurs on Friday, April 12th, from approximately 5:00 to 7:30 PM EDT, while the Moon is in Cancer. 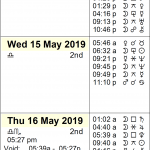 Another excellent period occurs from Saturday, April 13th, from approximately 8:15 AM EDT, to Sunday, April 14th, at approximately 9:35 PM EDT, while the Moon is in Leo. Note that if you start something before Sunday at 9:40 AM EDT, it’s an even better period since the Sun applies to Jupiter until then. Mercury sextile Saturn. A good time to get organized, to do detail work, and to prepare for the future. Decisions made now tend to be practical and well thought out. Work done now will have tangible results in the future. Mars sesquiquadrate Saturn. We are called upon to solve problems, or our plans and efforts meet with resistance. Circumstances seem to block our efforts to assert ourselves. Patience is necessary now, although frustration is very likely. It can feel like more effort than usual is required to complete tasks. Venus semi-square Uranus. Unusual attractions (to people and things) can have us acting on a whim. We may deal with freedom versus closeness issues in our relationships. Avoid impulse buys at this time, and hold off on decision-making with regards to finances. Some instability, restlessness, and rebelliousness is probable in romantic relationships. We may not see eye to eye with a loved one, and we could be taken off guard by unexpected events. This is not a favorable aspect for beauty treatments because they could have unexpected results. Venus conjunct Neptune. New and fresh beginnings on creative levels characterize this transit. Heightened sensitivity to, and awareness of, beauty and spirituality. We are easily influenced, seducible and seductive, and given to strong powers of imagination. We are more attuned to the world of beauty and romance today. Gentleness with others is the best way to harness this energy. A “magical” time on a romantic and social level, but it could also be a confusing or illusory influence as well. Psychic openness and compassion. Sun square Saturn. As we face obstacles to our goals, we begin to see the tools with which we have to overcome them. A heavy dose of realism seems forced upon us under this influence, but our efforts to measure up to expectations can ultimately increase our confidence in our ability to be responsible for ourselves. This influence is a somber one. Mercury sextile Pluto. We possess more insight and psychological understanding than usual. We are willing to look beyond the surface of things and investigate further. Perhaps more importantly, we are more patient and strategic in our decision-making. Mercury square Jupiter. Information overload is possible today. It is all too easy to miss or neglect important details. We may exaggerate, have a hard time putting our ideas to practical use, or overstate under this influence. This is an unfavorable transit for travel. Our ideas and plans may be too grandiose just now. We could have a hard time convincing others of our point of view, and we could too easily jump to conclusions. There could be a lot of talk about nothing. Lack of clear mental focus, but we may make measurable progress if we can concentrate. Mars sesquiquadrature Pluto. Our desires are intense and difficult to satisfy under this influence. A tendency to bully and confront may dominate. Efforts to make changes could be thwarted, or power struggles emerge. The trick is to remain flexible and to develop strategies for achieving our goals. Venus sextile Saturn. Affections stabilize and mature. Relationships are stabilized and steady, although feelings are expressed reservedly, formally, or sparingly. A new sense of realism in existing partnerships comes now. Small advances can be made in business and in partnerships. Support from older people or authority figures may come by way of solid advice or tangible help. Renewed ties to old friends are possible, or a new sense of responsibility in existing friendships. Sun square Pluto. Insubordination and abuse of power. Impatience with rules. Compulsiveness. The urge to get to the bottom of matters is with us, but we are too insistent. Avoid beating a dead horse and attempting to force matters that should naturally take time to unfold. Circumstances now can push us to discover our own power–power that comes from a strong sense of self rather than superficial energy derived from manipulating people into doing what we want them to do. Events may occur now that highlight the need to trust. 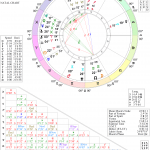 See also: Astrology of Today – an overview of the day – Astrology Cafe. New! 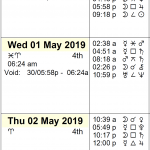 See the Transits for Here and Now chart wheel. 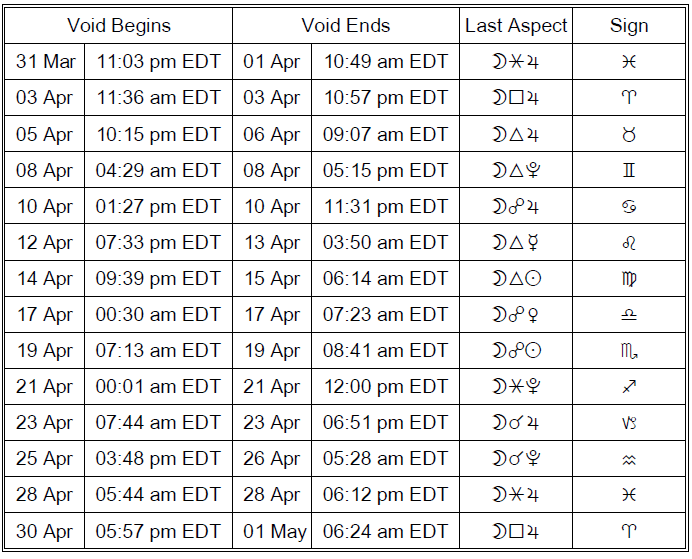 Jupiter stations and begins its retrograde period today (which lasts until August 11th). During this retrograde, we tend to re-think our goals and plans in the areas of life affected by Jupiter’s transit. It’s a time of questioning what we thought we already knew and developing a new perspective on events and beliefs. Recognizing areas of excess or extravagance can help us. We may need to slow down specific endeavors if they’ve been moving too quickly, or this happens organically. Some enthusiasm may wane as certain realities of time and energy set in. With Jupiter stationary today, we are inclined toward a fair amount of longing and idealism. Mercury’s sextile to Pluto today can bring new awareness to a matter that we’ve recently researched. We might arrive at valuable truths or insights, or we gain a deeper understanding of a situation. We might discover new information that gives us an edge or finally “see” the truth of a matter that we’ve been avoiding. It’s a good time to let go of something that has kept us bound or stuck in a difficult situation. The Moon spends most of the day in the sign of Gemini, only entering Cancer tonight at 11:31 PM EDT. The Sun-Pluto square perfects this morning, and trusting in others (or in life/the process) can be difficult. This aspect is strong for identifying areas of over-attachment, but we may find it difficult to let go and unwind while it’s active. It’s important to avoid trying to force matters that should naturally take time to unfold. As the day advances, however, we approach a Sun-Jupiter trine that encourages our desire to grow, expand, improve, and impress. In contrast, this aspect helps to build up our faith. Whether it’s a business venture, friendship, attitude, or relationship, we want to bring it to a new level. Optimism and confidence are core elements in the energy of this transit. Enthusiasm runs high, and cooperation comes readily. The Moon continues its void period until it enters Leo today at 3:50 AM EDT. Our basic instinct is to communicate, think, and learn under the influence of Moon in Gemini. We are motivated by a desire for variety and by an instinctive curiosity. The Moon in Gemini is light-hearted, breezy, and curious, but it can also be restless and fickle.